"As you witness, divorce yourself from the thought that you are merely seeking “decisions for Christ.” What we should be seeking is repentance within the heart. This is the purpose of the Law, to bring the knowledge of sin. How can a man repent if he doesn’t know what sin is? If there is no repentance, there is no salvation. Jesus said, “Unless you repent, you shall all likewise perish” (Luke 13:3). God is not willing that any should perish, but that all should come to repentance (2 Peter 3:9). Many don’t understand that the salvation of a soul is not a resolution to change a way of life, but “repentance toward God, and faith toward our Lord Jesus Christ.” The modern concept of success in evangelism is to relate how many people were “saved” (that is, how many prayed the “sinner’s prayer”). This produces a “no decisions, no success” mentality. This shouldn’t be, because Christians who seek decisions in evangelism become discouraged after a time of witnessing if “no one came to the Lord.” The Bible tells us that as we sow the good seed of the gospel, one sows and another reaps. If you faithfully sow the seed, someone will reap. If you reap, it is because someone has sown in the past, but it is God who causes the seed to grow. If His hand is not on the person you are leading in a prayer of committal, if there is not God-given repentance, then you will end up with a stillbirth on your hands, and that is nothing to rejoice about. We should measure our success by how faithfully we sowed the seed. In that way, we will avoid becoming discouraged." How do I reach my neighbors with the gospel? "Neighbors are like family. We don’t want to offend them unnecessarily, because we have to live with them. We need to be rich in good works toward all men, but especially our neighbors. The Bible reveals that this is a legitimate means of evangelism. Jesus said, "Let your light so shine before men, that they may see your good works, and glorify your Father which is in heaven" (Matthew 5:16). It is God’s will that "with well doing you may put to silence the ignorance of foolish men" (1 Peter 2:15). Sinners may disagree with what you believe, but seeing your good works makes them think, "I don’t believe what he believes, but he sure does. He certainly is sincere in his faith." A friendly wave, a gift for no reason, fresh-baked goods, etc., can pave the way for evangelism. Offer to mow your neighbor's lawn or help do some painting. Volunteer to pick up their mail and newspaper while they’re on vacation. Compliment them on their landscaping and ask for gardening tips. Invite them over for a barbecue or dessert. Pray for an opportunity to share the gospel, and be prepared for it when it comes." How should I witness to my coworkers? "When we interact with people on a daily basis, we have many opportunities for sharing our faith. First, be sure you are respectful to your employer and set a good example in your work ethic by working "as to the Lord" (Colossians 3:23). When others around you grumble and complain, if you have a calm, forgiving, steadfast spirit, it will make an impression. As you respond in a Christ-like way to angry coworkers and stressful circumstances, people will see a difference in your life. Always be friendly and courteous, and show genuine interest in your coworkers’ lives. Invite them out to lunch to get better acquainted. Share their joys and sorrows by congratulating them in their good times and offering to pray for them in their bad times. Be sure you do pray for them, then follow up by asking them about the situation you prayed for. They will be moved by your concern. If coworkers are discussing what they did during the previous weekend, you can share your excitement about attending church services or a special church event. Ask others if they have any plans for celebrating Christmas or Easter; be nonjudgmental of their answer, but be ready (if asked) to explain why you celebrate as you do. Displaying a favorite Scripture or a devotional calendar, or reading your Bible during lunchtime, may prompt others to inquire about your faith. Bringing home-baked goods or leaving a small gift with a note on a coworker’s desk can sometimes have a greater impact than a thousand eloquent sermons. We can show our faith by our works. Others may not like a tree of righteousness, but they cannot help but like its fruit. Pray for opportunities to share the gospel, being careful not to infringe on your boss’s time." A person is not saved by their works. Neither can a person lose their salvation by their works. "Praise be to the God and Father of our Lord Jesus Christ! In his great mercy he has given us new birth into a living hope through the resurrection of Jesus Christ from the dead, and into an inheritance that can never perish, spoil or fade—kept in heaven for you, who through faith are shielded by God's power until the coming of the salvation that is ready to be revealed in the last time." After the Philistines had captured the ark of God, they took it from Ebenezer to Ashdod. Then they carried the ark into Dagon's temple and set it beside Dagon. When the people of Ashdod rose early the next day, there was Dagon, fallen on his face on the ground before the ark of the LORD! They took Dagon and put him back in his place. But the following morning when they rose, there was Dagon, fallen on his face on the ground before the ark of the LORD! His head and hands had been broken off and were lying on the threshold; only his body remained. That is why to this day neither the priests of Dagon nor any others who enter Dagon's temple at Ashdod step on the threshold. God has a sense of humor. Their false god had to be helped up off the floor! LOL! And this false god was worshiping Yahweh! I consider this one of the humorous sections in the Bible. The ark was placed next to the image of Dagon by the Philistines in order to demonstrate Dagon's superiority over the God of Israel, but instead, God showed His superiority (since He is the one and only true God, after all) when Dagon was toppled to a position of homage before the ark of the Lord. This reminds me of the way God humiliated each of the Egyptian gods, one by one, in the Ten Plagues, basically turning each one of the Egyptian gods into specific curses to plague the Egyptians who worshiped them. The LORD's hand was heavy upon the people of Ashdod and its vicinity; he brought devastation upon them and afflicted them with tumors. [Hebrew; Septuagint and Vulgate, '...tumors. And rats appeared in their land, and death and destruction were throughout the city.' Some theologians suggest it may have been bubonic plague.] When the men of Ashdod saw what was happening, they said, "The ark of the god of Israel must not stay here with us, because his hand is heavy upon us and upon Dagon our god." So they called together all the rulers of the Philistines and asked them, "What shall we do with the ark of the god of Israel?" They answered, "Have the ark of the god of Israel moved to Gath." So they moved the ark of the God of Israel. But after they had moved it, the LORD's hand was against that city, throwing it into a great panic. He afflicted the people of the city, both young and old, with an outbreak of tumors. [Or, with tumors in the groin. (see Septuagint.) Some have even suggested it might have been hemorrhoids.] So they sent the ark of God to Ekron. As the ark of God was entering Ekron, the people of Ekron cried out, "They have brought the ark of the god of Israel around to us to kill us and our people." So they called together all the rulers of the Philistines and said, "Send the ark of the god of Israel away; let it go back to its own place, or it [Or, 'he'] will kill us and our people." For death had filled the city with panic; God's hand was very heavy upon it. Those who did not die were afflicted with tumors, and the outcry of the city went up to heaven. Note that, in the previous chapter, 1 Samuel 4:3 says, When the soldiers returned to camp, the elders of Israel asked, "Why did the LORD bring defeat upon us today before the Philistines? Let us bring the ark of the LORD's covenant from Shiloh, so that it [or, 'he'] may go with us and save us from the hand of our enemies." The Israelites put their faith in the ark, not in God Himself. They now idolized it. The things of God - physical things - should not replace God. Also, the Israelites never called out to God, which is what they really should have done. This shows what happens when you turn to the outward symbols of religion instead of God Himself. It's also interesting to note that 1 Samuel 4:21-22 says, She named the boy Ichabod, saying, "The glory has departed from Israel" - because of the capture of the ark of God and the deaths of her father-in-law and her husband. She said, "The glory has departed from Israel, for the ark of God has been captured." "Ichabod" means "no glory." The glory of Israel was Israel's God, not the ark. Israel wrongly thought that, in spite of their wickedness, they had the power to coerce God into doing their will simply because they possessed the ark. (This name, 'Ichabod,' always reminds me of Ichabod Crane in Washington Irving's "The Legend of Sleepy Hollow." "He follows strict morals in the schoolroom, including the proverbial "Spare the rod and spoil the child"; outside the schoolroom, he is shown to have few morals and no motive but his own gratification. Despite being thin, he is capable of eating astonishingly large amounts of food and is constantly seeking to do so. In addition to this, he is excessively superstitious, often to the extent of believing every myth, legend, tall tale, etc. to be literally true. As a result, he is perpetually frightened by anything that reminds him of ghosts or demons." "During his journey, he encounters another traveler, who is eventually revealed to be the legendary Headless Horseman; the ghost of a Hessian soldier who was decapitated by a cannonball. Ichabod flees, eventually crossing a bridge near the Dutch burial ground. Because the ghost is incapable of crossing this bridge, Ichabod assumes that he is safe; however, the Hessian throws his own severed head at Ichabod, knocking him from the back of his own horse and falling onto the road. The next morning, Ichabod's hat is found abandoned, and close beside it a shattered pumpkin. Ichabod is never seen in Sleepy Hollow again, and is therefore presumed to have been spirited away by the Headless Horseman." Pesach, the Passover Seder, tells the story of deliverance, freedom, and redemption. 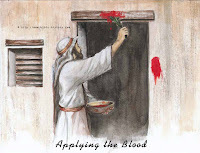 Death passed over those who exercised active faith in YHWH by putting lamb's blood on the doorposts. The Second Death (Hell, Rev. 2:11, Rev. 20:14) passes over the Christian, since the Christian is marked by the blood of Christ. Tradition teaches us that we must all consider ourselves as slaves in Egypt (Rom. 6:6, Rom. 6:16-22) that we must all consider ourselves to have walked in darkness (Rom. 3:23), so that we might celebrate the deliverance in the Exodus as our own deliverance (Rom. 6:7, Rom. 6:18, Rom. 6:20, Rom. 6:22, Rom. 8:2, Heb. 9:15, Rev. 1:6). At the death of Jesus, the great veil which guarded the Holy Place within the Temple was supernaturally ripped from top to bottom (Matthew 27:51). As is made clear in the book of Hebrews (Hebrews 9, Hebrews 10), access to God the Father in heaven is now open to all who call upon Jesus Christ - both Jew and Gentile. Animal sacrifices, since then, were no longer required as part of the true worship. And the Temple being destroyed in AD 70 assured that they were no longer possible. Jesus had forecast this to the Samaritan woman: "The hour comes when you shall neither in this mountain [in Samaria] nor yet at Jerusalem [in the Temple] worship the Father..." (John 4:21). The purpose of all the animal sacrifices was fulfilled in Christ (Hebrews 10). No more is there a "blood sacrifice," for Jesus Christ, in His suffering and death, perfectly fulfilled the foreshadowing Passover symbolism. By His blood - shed once, for all - He covers and forgives our sin, delivering us from eternal death, and the indwelling Holy Spirit releases us from the slavery of our human nature. Then, by His victorious, overcoming resurrection from the dead, Jesus was credentialed as the Son of God, making possible our eternal redemption. On the 14th day of the month of Nisan in the Hebrew calendar, the Passover lamb was sacrificed. The 15th is the first day of the seven-day long Unleavened Bread Festival (Leviticus 23) in spring. On that night, death passed by the children of Israel, protected in their blood-bedecked homes. In that night they began to leave Egypt after decades of enslavement - for freedom. Probably the most significant observance related to Pesach involves the removal of chametz (sounds like "hum it's" with that Scottish "ch") from Jewish homes. This commemorates the fact that the Jews leaving Egypt were in a hurry, and did not have time to let their bread rise. The process of cleaning the home of all chametz (leaven) in preparation for Pesach is an enormous task. To do it right, you must prepare for several weeks and spend several days scrubbing everything down, going over the edges of your stove and refrigerator with a toothpick and a Q-Tip, covering all surfaces that come in contact with food with foil or shelf-liner, etc., etc., etc. After the cleaning is completed, the morning before the Seder, a formal search of the house for chametz is undertaken, and any remaining chametz is burned. Leaven (yeast) is a necessary element in baking and wine-making. However, it was viewed somewhat ambiguously because it also has the power to decay and destroy. Even Jesus used it as both a positive and negative metaphor. In Jewish tradition, it came to have more of a negative connotation as a religious symbol, signifying the potential for corruption and sin. 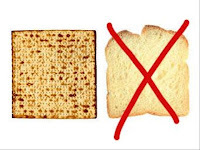 Therefore, the removal of leaven carries with it deeper significance in Passover than simply its connection with the exodus. Its removal, and the symbolic removal at the beginning of the Seder, signifies the attitude of penitence, the willingness to remove any corrupting influence in one’s life and submit to God in obedience. As the Israelites prepared for the exodus by obeying the commands of God through Moses, so in removing the chametz (leaven, or yeast), we symbolize our willingness to obey God in preparation for celebrating the deliverance he has already brought to His people. We should search for any hidden sins in our hearts, for it is sin that keeps us from intimate fellowship with God. This shows how serious God is about sin. Even the smallest sin can keep a person out of Heaven. Since every person has sinned, that's why only Jesus can save us from Hell. The removal of leaven also shows that, when a person surrenders their life to Christ and becomes regenerated by the power of the Holy Spirit, the holiness of Christ is transferred to them, and they are considered positionally sinless in the eyes of God. On another level, the removal of leaven also symbolizes the sanctification process of the Christian. As the Christian gets to know Christ Jesus better and better, he or she should be becoming more and more Christlike, and obeying God more and more. The Israelites were not merely to remove all leavening and leavened foods from their property. That would have only symbolized putting away sin. They were commanded to eat unleavened bread during the Feast of Unleavened Bread. This act of eating unleavened bread symbolizes the opposite of sin, which is active obedience to God. Jesus warns us in Luke 12:1 about leaven: "Beware of the leaven of the Pharisees, which is hypocrisy." Throughout Matthew 23, Jesus lists a multitude of Pharisaical sins that could be grouped as legalistic externalism. In Matthew 16:6, Jesus warns of the leaven of the Sadducees. The Sadducees' sins are not listed, but elsewhere we find they at least denied the supernatural and the resurrection of the dead (Acts 23:8). Jesus also warns of the leaven of Herod (Mark 8:15). Herod was involved in a great deal of lying in his political wheeling and dealing, abusing the power of his office, adultery, and general all-around worldliness. "Therefore purge out the old leaven, that you may be a new lump, since you truly are unleavened. For indeed Christ, our Passover, was sacrificed for us. Therefore let us keep the feast, not with old leaven, nor with the leaven of malice and wickedness, but with the unleavened bread of sincerity and truth." Christians have been sanctified (made holy and set apart for God), regenerated ('born again;' made into new creatures, 2 Cor. 5:17, Gal. 6:15), justified (declared innocent, since, legally speaking, Jesus provided our bail by being surety for us and paying our debt with His blood). Christians are also being sanctified (purified) by God's Word, through suffering, by the washing of Jesus' blood, and by being constantly filled with the Holy Spirit. We are to demonstrate the reality of our salvation in our daily lives. What has been done in us must be worked outward, so that the holiness which we have been given positionally becomes more and more evident in our lives. The name "Pesach" (PAY-sahch, with a "ch" as in the Scottish "loch") comes from the Hebrew root Pei-Samekh-Cheit, meaning to pass through, to pass over, to exempt or to spare. It refers to the fact that Yahweh (YHWH) "passed over" the houses of the Jews when he was slaying the firstborn of Egypt. In English, the holiday is known as Passover. "Pesach" is also the name of the sacrificial offering (a lamb) that was made in the Temple on this holiday. The holiday is also referred to as Chag he-Aviv (the Spring Festival), Chag ha-Matzot (the Festival of Matzahs), and Z'man Cheiruteinu (the Time of Our Freedom) (again, all with those Scottish "ch"s). To a large degree, the Passover lamb has been eliminated from the Passover festival (with the only remnant being the roasted lamb shank bone). The New Testament says that Jesus is our sacrificial Lamb. The Passover lamb was to be a "male without defect," which is the same description given to Jesus. In addition, when the lamb was roasted and eaten, none of its bones were to be broken. This fact was also prophesied for the Messiah, whose bones were not to be broken. It was customary during crucifixions to break the leg bones of the person after a few hours, in order to hasten their death. The only way a person could breathe when hanging on a cross was to push up with his legs, which was very exhausting. By breaking the legs, death followed soon by asphyxiation. However, in the case of Jesus, they broke the legs of the other two men, but did not break His, since He was already dead. Much of the symbolism of Jesus' last Passover week is lost to us because we are unaware of the customs of the time. For example, Jesus came into the city of Jerusalem five days before the lamb was killed in the temple as the Passover sacrifice for the sins of the people of Israel. Five days before the lamb was to be sacrificed, it was chosen. Therefore, Jesus entered Jerusalem on lamb selection day as the lamb of God. The people did not understand the significance of this, since they greeted Him with palm branches and hailed Him as King, shouting "Hosanna," which means "save us." However, they were not looking for a spiritual Savior, but a political savior. Palm branches were a symbol of freedom and defiance, since Simon Maccabeus had entered Jerusalem with that symbolism. Jesus' reaction was to weep, since He realized that they did not understand the Messiah's purpose in coming. Good Friday was the day of the Passover celebration and the day that the Passover lamb was to be sacrificed. For the previous 1,200 years, the priest would blow the shophar/shofar (ram's horn) at 3:00 p.m. - the moment the lamb was sacrificed, and all the people would pause to contemplate the sacrifice for sins on behalf of the people of Israel. On Good Friday at 3:00, when Jesus was being crucified, He said, "It is finished" - at the moment that the Passover lamb was sacrificed and the shophar was blown from the Temple. The sacrifice of the lamb of God was fulfilled at the hour that the symbolic animal sacrifice usually took place. At the same time, the veil of the Temple (a three-inch-thick, several-story-high cloth that demarked the Holy of Holies) tore from top to bottom - representing a removal of the separation between God and man. Fifty days later, on the anniversary of the giving of the law (Pentecost), God left the earthly temple to inhabit those who call on the name of Jesus through His Holy Spirit. Christian symbolism in the Passover occurs early in the Seder (the Passover dinner). Three matzahs/matzohs are put together (representing the Father, Son, and Holy Spirit). The middle matzah is broken, wrapped in a white cloth, and hidden, representing the death and burial of Jesus. The matzah itself is designed to represent Jesus, since it is striped and pierced, which was prophesied by Isaiah, David, and Zechariah. Following the Seder meal, the "buried" matzah is "resurrected," which was foretold in the prophecies of David. It was during a Passover Seder that Jesus proclaimed that the meal represented Himself and that He was instituting the New Covenant, which was foretold by Jeremiah, Ezekiel, and Isaiah. The celebration of this covenant has become the ordinance of communion in the Christian Church. At the end of the meal, Jesus took the unleavened bread, broke it, and said that it represented His body. Then He took the cup of wine, which would have been the third cup of the Seder - the cup of redemption. He said that it was the new covenant in His blood "poured out for you." It is through the sacrificial death and resurrection of Jesus Christ that we are declared clean before God, allowing those who repent of their sin and surrender their lives to follow Christ, choosing to accept His pardon, to commune with Him - both now and forevermore through the eternal life He offers. This reminds us that God did not begin his revelation of Himself in the world with Christians, but to Hebrews---to Israelites---to the Jew---first. It also reminds us that Jesus was a Jew. It is only in recognizing that connection we have to four thousand years of God at work creating a people that those of us who are born again (regenerated) can truly appreciate who we are as the people of God. Some of the verses above include all members of the triunity (Isaiah 42:1, Isaiah 48:16, and Isaiah 61:1). Therefore, the Old Testament does reveal the Christian concept of the Godhead, with God being one God, consisting of three persons. How can God simultaneously exist as both singular and plural? It is a logical impossibility if God were restricted to the three dimensions of space and one dimension of time of our physical universe. However, the attributes of God, given by the Bible, provide a reasonable explanation of how this paradox can be resolved. Deuteronomy 6:4 says, "Hear, O Israel! Yahweh is our God, Yahweh is one [echad]!" The Hebrew word "echad" is used most often as a unified one, and sometimes as numeric oneness. For example, when God said in Genesis 2:24 "the two shall become one [echad] flesh," it is the same word for "one" that was used in Deut. 6:4. A different word, "yachid," the main Hebrew word for solitary oneness, indisputably means an absolute numeric one. Anti-Trinitarians would naturally expect such a word to be commonly used of God, but it is never used to describe God. Add to this plural pronouns like: "let US make man in OUR image" and Trinitarians have irrefutable evidence of the Trinity in the Old Testament. We find exactly the same in the New Testament as we do in the Old, namely, a combination of words meaning unified versus numeric oneness being employed to describe God's oneness. While yachid is never used of God’s oneness in the Old Testament, the corresponding Greek word "mono" is used of God’s oneness in the New Testament. But this is exactly what Trinitarians would expect to be the case because there are three persons in the one God. Perhaps one of the strongest arguments the Trinitarian can use in the discussion of the words "echad" and "yachid" is the fact that Jews, shortly after the rise of Christianity, removed "echad" from Deut. 6:4 and added in its place the word "yachid". If the use of "echad" instead of "yachid" in Deut. 6:4 gave no help to the early Christians in proving to the Jews that Yahweh of the Old Testament was a multi-personal God, then Jews would not have felt compelled to change the word. If it is really that insignificant, then they would have told us the argument Christians were using to prove the Trinity is invalid to native Hebrews who know and speak the language. But instead, the Jews responded by changing the word in Deut. 6:4 from the unified oneness (echad) to the numeric oneness (yachid). Jesus quoted Deut 6:4 in Mk 12:29 and chose the "unified oneness" word "hen" which is the same word used by Jesus in Mt 19:5, "the two shall become one (hen) flesh. It is significant that Jesus did not use "mono" in Mk 12:29. The word "hen" directly corresponds to "echad" which was used in Deut 6:4. Both texts used "unified oneness" words rather than absolute numeric oneness to the exclusion of all others. My previous article presented the text from the fifth chapter of the gospel of John. In this article, I wish to expand on that a little bit. In John 5:1-15, Jesus healed a man diseased for thirty-eight years. The Jews never forgave Jesus for healing this man on the Sabbath, nor for His claim of personal equality with God (John 5:16-18), and humanly speaking, this opened the opposition that eventually cost Jesus the Christ His life. Jesus told the invalid to get up. Jesus’ command always carries with it His quickening power to obey. However, the obedience and the power are simultaneous. To refuse to obey in faith is not to experience the power. Similarly, Paul describes fallen humanity and every descendant of Adam as being dead (limp, lifeless, helpless) in transgressions and sins (Ephesians 2:1). He then speaks of God’s quickening power to make dead people alive. 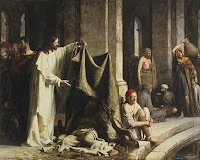 Jesus gave the invalid at the pool of Bethesda strength but also required him to carry his responsibilities---his mat. He told him to pick up his mat and walk. This could also symbolize the idea: “Accept your circumstances but carry them in triumph, trusting in My imparted strength.” Not until he obeyed did this man experience the totally new life and strength created within him. Immediately, the healed man ran into opposition. Opposition is similarly inevitable for any active Christian (Acts 14:22; 1 Peter 2:20-21). Those of us who are Christians need to expect opposition, trials to test our faith, and difficult circumstances, for these are appointed for us, and “we are destined for them” (1 Thessalonians 3:3). God allows opposition so that we may be deeply rooted in Him and experience the delights of proving His strength and comfort given in trials. Jesus ordered the now-healed invalid to stop sinning. After Jesus had broken the power of sin over him, He warned him of the danger and of the consequences of indulging in the habit of whatever sin in which he had been involved. We, too (those of us who are followers of Christ), are made whole in order to live in newness of life with new habits that please God. We were chosen in Christ “before the creation of the world to be holy and blameless in His sight” (Ephesians 1:4). We are called to be set apart from sin (separated) and set apart for God (sanctified) through the power of the new life of the Holy Spirit given to us by God (2 Thessalonians 2:13). This is true wholeness. We work out what He has first worked within (Philippians 2:13). The healed man then began witnessing to others about Jesus (John 5:15). Those who have been made whole by Jesus want to tell others about Him. We who are born-again, regenerated Christians with new lives should be doing the same. I used Illustrator and Photoshop to create the above image. The font is called Rad Std (I did not draw the characters). I expanded the font in Illustrator to vectorize the text, then in Photoshop, I colored in the areas using the paint bucket and brush (drawing in a few black lines here and there), added one word on one of the skateboards, and added a couple effects (drop shadow and emboss). Pretty simple and basic. My previous articles on John have used the NIV (New International Version), which is currently my favorite version (I know some people do not like the NIV, but I do). For this particular article, however, I decided to switch things up and use a different version, just for variation (and I may use still other translations in the future, just to keep things interesting). The below verses are from "The Message," which is a version where the translator (Eugene Peterson) has strived for the spirit of the original manuscripts—to express the rhythm of the voices, the flavor of the idiomatic expressions, the subtle connotations of meaning. Some people like to read the Bible in Elizabethan English. Others want to read a version that gives a close word-for-word correspondence between the original languages and English. The goal of "The Message" is to engage people in the reading process and help them understand what they read. This is not a study Bible, but rather a reading Bible. "Soon another Feast came around and Jesus was back in Jerusalem. Near the Sheep Gate in Jerusalem there was a pool, in Hebrew called Bethesda, with five alcoves. Hundreds of sick people—blind, crippled, paralyzed—were in these alcoves. One man had been an invalid there for thirty-eight years. 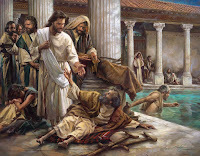 When Jesus saw him stretched out by the pool and knew how long he had been there, he said, "Do you want to get well?" The sick man said, "Sir, when the water is stirred, I don't have anybody to put me in the pool. By the time I get there, somebody else is already in." Jesus said, "Get up, take your bedroll, start walking." The man was healed on the spot. He picked up his bedroll and walked off. That day happened to be the Sabbath. The Jews stopped the healed man and said, "It's the Sabbath. You can't carry your bedroll around. It's against the rules." But he told them, "The man who made me well told me to. He said, 'Take your bedroll and start walking.'" They asked, "Who gave you the order to take it up and start walking?" But the healed man didn't know, for Jesus had slipped away into the crowd. A little later Jesus found him in the Temple and said, "You look wonderful! You're well! Don't return to a sinning life or something worse might happen." But Jesus defended himself. "My Father is working straight through, even on the Sabbath. So am I." That really set them off. The Jews were now not only out to expose him; they were out to kill him. Not only was he breaking the Sabbath, but he was calling God his own Father, putting himself on a level with God. So Jesus explained himself at length. "I'm telling you this straight. The Son can't independently do a thing, only what he sees the Father doing. What the Father does, the Son does. The Father loves the Son and includes him in everything he is doing. "But you haven't seen the half of it yet, for in the same way that the Father raises the dead and creates life, so does the Son. The Son gives life to anyone he chooses. Neither he nor the Father shuts anyone out. The Father handed all authority to judge over to the Son so that the Son will be honored equally with the Father. Anyone who dishonors the Son, dishonors the Father, for it was the Father's decision to put the Son in the place of honor. "It's urgent that you get this right: The time has arrived—I mean right now!—when dead men and women will hear the voice of the Son of God and, hearing, will come alive. Just as the Father has life in himself, he has conferred on the Son life in himself. And he has given him the authority, simply because he is the Son of Man, to decide and carry out matters of Judgment. "Don't act so surprised at all this. The time is coming when everyone dead and buried will hear his voice. Those who have lived the right way will walk out into a resurrection Life; those who have lived the wrong way, into a resurrection Judgment. "I can't do a solitary thing on my own: I listen, then I decide. You can trust my decision because I'm not out to get my own way but only to carry out orders. If I were simply speaking on my own account, it would be an empty, self-serving witness. But an independent witness confirms me, the most reliable Witness of all. Furthermore, you all saw and heard John, and he gave expert and reliable testimony about me, didn't he? "But my purpose is not to get your vote, and not to appeal to mere human testimony. I'm speaking to you this way so that you will be saved. John was a torch, blazing and bright, and you were glad enough to dance for an hour or so in his bright light. But the witness that really confirms me far exceeds John's witness. It's the work the Father gave me to complete. These very tasks, as I go about completing them, confirm that the Father, in fact, sent me. The Father who sent me, confirmed me. And you missed it. You never heard his voice, you never saw his appearance. There is nothing left in your memory of his Message because you do not take his Messenger seriously. "You have your heads in your Bibles constantly because you think you'll find eternal life there. But you miss the forest for the trees. These Scriptures are all about me! And here I am, standing right before you, and you aren't willing to receive from me the life you say you want. "I'm not interested in crowd approval. And do you know why? Because I know you and your crowds. I know that love, especially God's love, is not on your working agenda. I came with the authority of my Father, and you either dismiss me or avoid me. If another came, acting self-important, you would welcome him with open arms. How do you expect to get anywhere with God when you spend all your time jockeying for position with each other, ranking your rivals and ignoring God? "But don't think I'm going to accuse you before my Father. Moses, in whom you put so much stock, is your accuser. If you believed, really believed, what Moses said, you would believe me. He wrote of me. If you won't take seriously what he wrote, how can I expect you to take seriously what I speak?" The four gospels describe Jesus performing around thirty-six specific miracles and mention that he did many more. The miracles are of different types. Jesus healed people: he is described as restoring sight, healing contagious skin disorders, healing the lame, curing fevers, putting back a severed ear, stopping a haemorrhage and restoring a withered hand. The most extreme form of healing is provided by three records of Jesus bringing people back to life: Jairus’ daughter, a widow’s son and Lazarus of Bethany. Jesus had an extraordinary power over nature: he miraculously multiplied bread and fish, changed water into wine, calmed a storm, walked on water and gave fishermen miraculous catches of fish. Jesus had miraculous knowledge and was aware of hidden facts and attitudes. Jesus also performed exorcisms of people oppressed by demonic powers. - Jesus often performed miracles in a quiet and unspectacular way. Sometimes he turned bystanders away in order to perform miracles; on other occasions he asked that his healings not be reported. There was nothing of the showman about Jesus. - Jesus performed miracles with the minimum of actions and words, generally healing with no more than a few words and sometimes a gesture. - The basis of Jesus’ miracles was his own personal authority. He is never recorded as praying for God to do a miracle, or even doing a miracle in God’s name: he did them himself. - Jesus refused to do miracles on demand to prove who he was and he had little time for sensation seekers. He never did miracles for profit or publicity or even to save himself. Jesus’ motive in doing miracles is given as compassion.